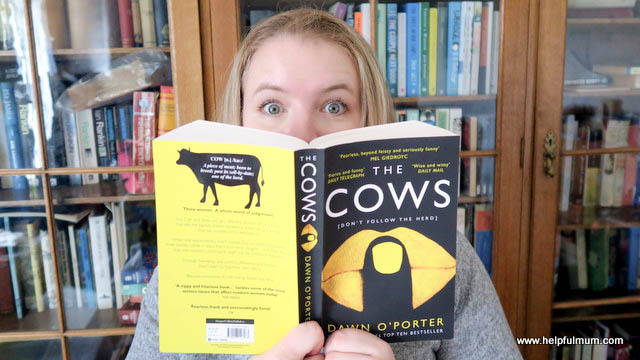 The Cows by Dawn O'Porter is the latest book in the Mumsnet Book Club. It's a book about feminism, not following the herd and finding your voice. It focuses on three women Cam, Tara and Stella. Cam is a successful blogger who has a no-nonsense approach to her writing. She has decided not to have children and is open and honest about it. Tara is a single mother who has an important career as a TV documentary maker. Stella is a PA to a photographer and artist and her life is filled with grief, loss and fear after the death of both her twin sister and her mother to cancer. Initially, I struggled with the three person narrative, but as you get to know each character more this struggle disappears. The book follows the lives of the three women, seeing how they become linked by the end of it. After Tara becomes an internet sensation for all the wrong reasons, the book explores public shaming, internet trolling and the impact that this can have on every part of your life. It's an interesting view on the idea of contemporary feminism, that women now have more choices available to them in terms of their work, but that in order to be able to take those options, they have to make decisions on their lifestyle which others will then judge. It's almost a Catch 22 situation to be in, but it brings to life how difficult being a working mother can be. The Cows made me question how I perceive other women, and what I could do to not be judgemental. It was a realistic depiction of women in society today, the impact of social media, both bad and good, on our lives and the need for good friendships. Overall I really enjoyed reading The Cows. The characters were all flawed in some way, which is realistic and believable. They are, however, all united in that they are all strong women, looking to find their place in the world. I enjoyed the writing style, and as a blogger, found the addition of blog posts and tweets as part of the prose enjoyable. It also meant that the book didn't take long to read at all. My only disappointment was with one of the twists at the end (and I won't give it away), but it just felt a little rushed. If you want a book which celebrates the inner strength of women and unexpected friendships, then this is definitely one for you. Disclosure: I was sent this book as part of the Mumsnet Book Club. All opinions are my own and are honest and fair.